A little knowledge goes a long way. To that effect, I am currently attempting to read “Edward I: A Great and Terrible King” by Marc Morris. It is the latest on the great king (debatable in some circles, of course).Here is the compeIling cover. I say attempting because I am trying to read it on a Kobo Touch reader (a gift) which for me is turning out to be a pain. Like so much other technology, the boon of it is accompanied by a few banes. Firstly, the main reason I am reading on a reader is because, living in Canada, it is virtually impossible to find that book and many other historical books from the UK. If you do, you may pay an exhorbitant price. This one and one of the researched books in it, Edward I by Professor Michael Prestwich, cannot even be found in the public libraries here. Fortunately, I have been able to find Prestwich’s book at Google Books.One sometimes gets the feeling that in this modern age an item must have a high level of commercialism to be obtained. If you are looking at purchasing the item from abroad, you might be looking at up to and beyond 80$C. Such is the price of being a “history buff”. The alternate offered by our good friends at Amazon.com is the digital format which I purchased. It was not compatible with the Kobo Reader. So I had to refund that (which I may say, they were very accommodating about) and repurchase ( for a few dollars more) from the Kobo store. Of course, if I had wanted, I could have read the book on my desktop Kindle but of course, you do not get portability. After trial and error, I got the book onto the reader and have been attempting to read it since. 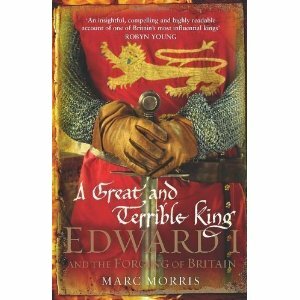 The book itself, is very readable and presents an interesting and easy to follow history of Edward’s reign. However, the screen is small and not all that responsive. The pagination of digital books is per chapter e.g. p.26 of 235. I find navigating this reader really stiff and not an experience you can relax with. Straight reading yes but navigating no. To that effect, I have ordered the actual book through Amazon.ca . It is only paperback and costs 30$ C. We will see what happens. After all, an actual book is portable too and won’t get lost if a machine goes down. I will report back when I finally get the book read. So far Morris’s slant on Edward is a sympathetic one. He amply backs up the reasons for Edward’s behavior but in a very political sense, as in a monarch trying to unite a country and dealing with the various forces that threaten that aim. I discovered that it would have been good to have some previous understanding of medieval warfare and the situation in Europe at the time. Ultimately, though one realizes that it was about land, ownership and power and the enslavement of the lower classes by their own as well as foreign kings. One is mesmerized by the strength of character and intelligence displayed by Edward, in spite of the cruel way he gained control of a nation. Of course, there is little to no actual evidence such as personal letters etc. to inform us of Edward’s personal life. Much of that comes from the financial and legal documents left behind. From these, authors follow his movements and activities and naturally make deductions. Of course, we also find something of the life of his wife Eleanor, and what her character was like. What kind of woman follows her husband on crusade and bears a child in a tent outside a half built castle? That is for another day. I will advise when the actual book gets here, one with actual pagination. This entry was posted in Researching, Scotland, The Family of Sarah Jane Clark and tagged books, Edward I, history, Scottish History by Shamwest. Bookmark the permalink.